Spring is one of my favourite times to live in Queensland. The risk of skin cancer isn't quite as high as in summer. In fact, with my fair skin and freckles, I find it too hot to swim in summer, unless it's before dawn or after sunset. Spring is the perfect time of year to take off on a sunny day and head to one of our famous beaches or national parks. If you're lucky, a spring getaway is awesome, because hotels and resorts offer bargain rates and packages before the summer peak period hits. Take this one: The Atlantis Marcoola is a family-friendly Sunshine Coast resort, just an hour or two from Brisbane, depending on where you live. 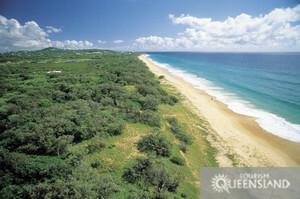 This is one of my favourite beaches in Queensland. It's beautiful, quite wild, and usually there are plenty of quiet spaces even on weekends and holidays. We stayed at the resort a few years ago, and it was awesome. It was out of season, and the manager kindly upgraded us to an apartment with an ocean view at no extra charge. There was free broadband wifi, a fitness area, and Austar as well. Even better, the Atlantis Marcoola is right on the beach, which means no scary roads to cross with the kids. And there's a really long walkway where they can ride their scooters, bikes or skate to their hearts' content. Like many other resorts, the Atlantis Marcoola is offering some great spring specials for those who need a break before the Silly Season mayhem begins. And apparently, the facilities have been refurbished since we last holidayed there. The best thing about the Sunshine Coast is that so much of it is free! You can look for koalas while walking in the Noosa National Park, swim under a waterfall then shop for arts and crafts in the hinterland, learn to surf, throw in a fishing line, or just roam the beach looking for shells and crabs. Of course, there are loads of day spas for those who need pampering, and adventure sports for those who feel the need for an adrenalin rush. Or you can just do what we usually do: Read, swim, spa, shop and eat far too much delicious food! Readers, what do you love about Spring? I love spring cause my Birthday is in spring :D (big smile) but I love all Seasons I don't have a fav season does that make me the odd one out? Thanks Sue and team, I hope to bring the kids up when school is out for the year. Fingers crossed! And Lorraine, I don't like cold weather either. And Susan, my birthday is in Spring also ... and it leads up to all the excitement of Christmas! The below-ground has domestic restaurants, lifetime structures and centuries.